Love Horses? 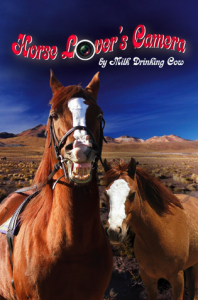 You'll Love Horse Lovers Camera. Love Horses? 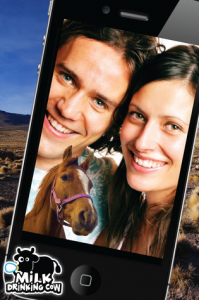 You’ll Love Horse Lovers Camera. 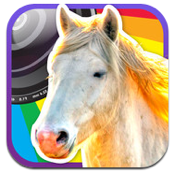 Horse Lovers Camera is another app offering from Milk Drinking Cow, the same developers behind PolitiCam and Horse Lovers Camera. And like those other apps, your mileage may vary. This app isn’t quite as much fun as the other two apps mentioned above…but if you’re seriously crazy about horses, you might love this one the best of the bunch. 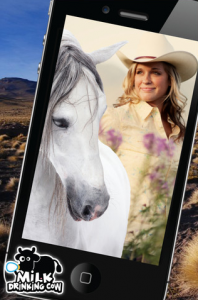 The app’s basic concept is simple: choose a cute horsie from the app’s library, choose a photo of yourself, and overlay the horse over your own image. The same things we said about the controls and interface in our reviews of PolitiCam and Dragon Camera apply here. The ability to move and adjust the size of the horses is very simple and intuitive. The interface is also very natural, and it’s easy to find the controls to select background images, trash your current image, and adjusting the camera’s flash and lenses. In fact, out of three Milk Drinking Cow camera apps we’ve tried recently, this one has the cleanest look. It’s very easy to get exactly the right position and size of the image, and that means stressed-out parents will find it easy to give their little girl that darn pony she’s been whining about for months. Unlike PolitiCam and Dragon Camera, Horse Lovers Camera doesn’t allow you to put more than one image on top of your photos. Unless you want to do the upgrade thing, which will allow you to superimpose unlimited horses on one image and also releases a whole pile of additional horsie pics. Still, the pics available at the basic free level have a great deal of variety in terms of breeds and positions, so you’ll still have a lot of fun. The app is very simple, and has a somewhat limited appeal for older users who aren’t crazy about horses. However, if you have kids or a real-life stable of your own, then this is a cute app with some replay value. Horse Lovers Camera is compatible with iPhone, iPod touch, and iPad.Requires iOS 4.2 or later. A small expedite fee was paid by the developer to speed up the publication of this iphone app review.